The new Nice striker has bad memories of his time at Liverpool. MARIO BALOTELLI FEELS joining Liverpool was the worst decision he has ever made and has taken aim at Brendan Rodgers and Jurgen Klopp in the process. The striker left AC Milan in favour of a move to Liverpool in 2014, but failed to make an impact at Anfield. Balotelli spent last season on loan back at Milan before exiting the club for Nice on deadline day and he is delighted to have left the Premier League side. “Joining Liverpool was the worst decision of my life. Apart from the fantastic fans and some player with whom I have an excellent relationship, I did not like the club,” Balotelli told Canal+. “I had two coaches at Liverpool, Rodgers and Klopp for a bit, I did not like their methods and their personality. I never really felt well there. “I am nothing like Zlatan [Ibrahimovic] for example. You could confront Zlatan with lions and he would still be calm. If you surround him with good people, he will still be calm. That’s the way he is. 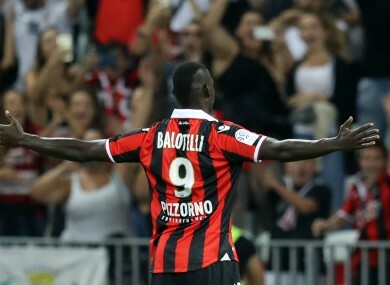 Balotelli, 26, started his Nice career by scoring the opener in Sunday’s Ligue 1 encounter with Marseille and he remains full of ambition for the near future. “It is not too late for me to win the Ballon d’Or,” he added. “I think I could have already won it by now, but I might be able to win it within two to three years by working hard and staying serious. Email “Mario Balotelli - 'Joining Liverpool was the worst decision of my life'”. Feedback on “Mario Balotelli - 'Joining Liverpool was the worst decision of my life'”.